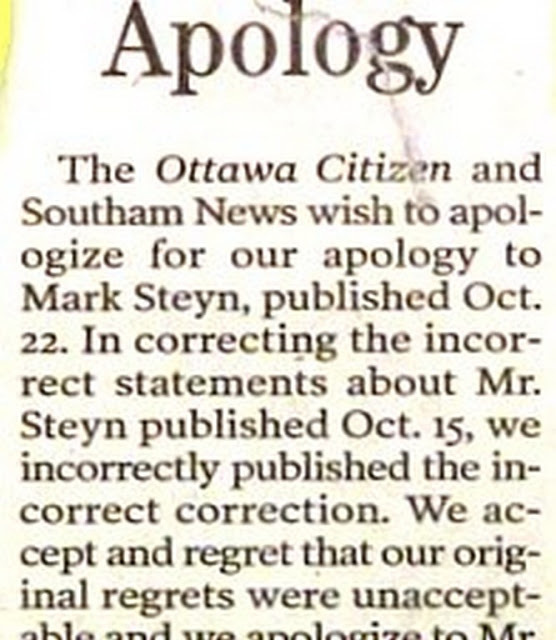 Can you tell what’s going on in this 2001 correction/apology published by the Ottawa Citizen? 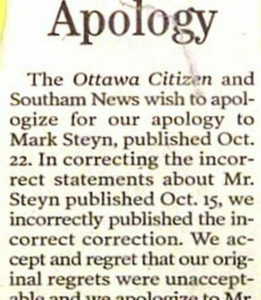 The Ottawa Citizen and Southam News wish to apologize for our apology to Mark Steyn, published Oct. 22. In correcting the incorrect statements about Mr. Steyn published Oct. 15, we incorrectly published the incorrect correction. We accept and regret that our initial regrets were unacceptable and we apologize to Mr. Steyn for any distress caused b our previous apology. I feel the offering deserves consideration as one of the top ten corrections of all time. Admittedly, though, it belongs at the bottom end of the list, due to the fact that it doesn’t actually tell you what the incorrect correction got wrong, or why the paper needed to apologize for its apology.